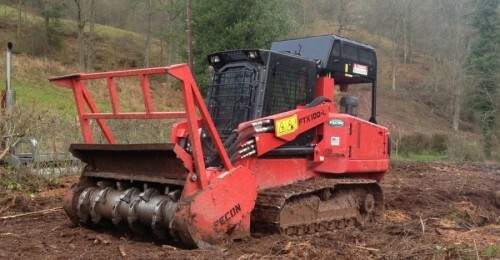 We undertake jobs of all sizes throughout the UK including tree stump grinding & tree root removal, forestry mulching and site clearance for both commercial clients and contractors, and private residential clients. We have a wide and varied client list including tree surgeons, landscape gardeners, forestry, country estates, property developers, local councils, and national construction companies. 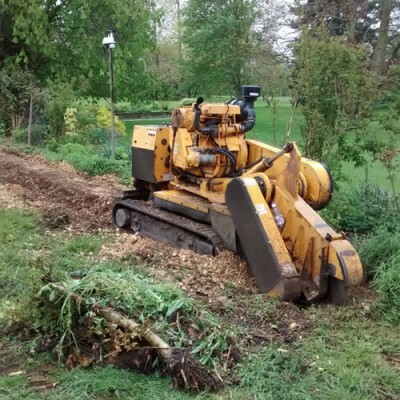 Our specialist equipment allows us to successfully work in all types of environments, including removing problematic tree stumps, roots and areas with limited access. We have access to the largest tracked stump grinder in the UK, the Carlton 'Hurricane' TRX, among many other high-end machines capable of tackling a wide range of other jobs, sites and situations. All our team are both qualified and certified to NPTC or Lantra approved standards. Not only that they are CSCS card holders and fully insured with £5m Public Liability Insurance. We aim to provide you with an estimate over the phone however, due to the nature of some jobs it may be necessary to visit the site before a quote can be given. Forestry mulching is an extremely efficient and environmentally sound method of clearing large areas of heavy vegetation. From thick undergrowth and scrub through to timber up to 8" in diameter. The resulting mulch that is left over on the ground from the cutting process will rot down over time, returning nutrients to the soil and greatly improving its structure whilst providing a very effective weed deterrent. There is no burning of brash or the need to bring in a lot of heavy machinery for the removal of waste arising from the clearance; it is all incorporated back into the ground. Whether you want land cleared for development, forestry, stewardship schemes, ecological reasons or simply tidying, the work can be speedily and professionally completed. We travel all over the Midlands, Wales and the South West clearing gorse. This is normally done to create otherwise lost and unproductive ground into areas that can be put back to agricultural use, which tends to be livestock grazing. Gorse is also commonly cleared so that trees can be planted in its place. The ground is deemed as unproductive land due to the gorse reducing the amount of available grass per acre for agricultural grazing. With the aid of a forestry mulcher the gorse can be cleared allowing the grass to come back and therefore bringing it back to productive claimable ground again, which then allows it to be claimed on the single farm payment. Because of the LGP type tracks and compactness of the mulcher, steep terrain is worked on and areas can be cleared that tractor mounted mulchers and other machines would have difficulty with. Also due to being on tracks you are left with no ruts or wheel marks and very little compaction. Contact us today for more information on how we can help you, or call on Tel: 01763 448095, Mobile 07599 549363.